Thiha is a medical doctor whose focus is on preventing communicable diseases. His ambition is to become a public health leader in his country. He has worked as an emergency medical relief officer, volunteered on a WHO malaria diagnosis and treatment project, and currently does social marketing and social franchising about communicable diseases with PSI. 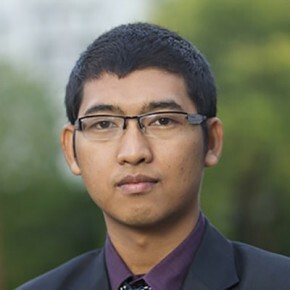 Born in Myanmar, Thiha obtained his medical degree in 2008 from the University of Medicine in Yangon, following internships at Thingangyun Sanpya General Hospital. He then became a member of Myanmar Medical Association (MMA), a respected local NGO, and worked as a trainer in the MMA- UNFPA-Reproductive Health Behavior Change Communication Project during which he conducted training sessions for factory workers on reproductive health and HIV/AIDS. At the same time, he volunteered in the WHO-Quality Diagnosis and Standard Treatment of Malaria Project to help people from malaria-endemic regions. When Cyclone Nargis hit Myanmar in 2008, Thiha immediately joined Médecins Sans Frontières (MSF-Switzerland) to help the victims of the cyclone and its aftermath. He worked as an emergency relief medical officer in some of the most remote and vulnerable areas, helping people to survive and overcome that most devastating situation. Thiha then joined Population Services International, one of the largest INGOs in Myanmar, doing social marketing and social franchising among the poor for TB, HIV, Malaria, STI, Reproductive Health, Pneumonia and other communicable diseases. In addition, he worked as a focal person in a Public-Private Mix DOTS (Directly Observed Treatment, Short-course) project and supervised outreach workers and community health workers who follow up with TB patients and ensure that they take their medications regularly. Thiha researched diagnostic techniques and epidemiological methods not yet practicable in Myanmar in order to apply them when he returns to his country. He studied social marketing techniques employed in the West and to learning skills associated with effective public health education and advocacy. He completed a research paper on the significant linkage between migration and defaulter rates, and migration and the transmission chain, as well as the importance of law enforcement and full psychosocial support in treating poor tuberculosis patients. Based on his findings, he wrote a project proposal advocating specific healthcare public policy reforms for his country.